Chances are you’ve purchased or received something bought on Amazon. Not only can you buy everything from DVD’s to diapers, first person product reviews accompany almost every product. Even reviews are reviewed by being rated by others on the site according to how helpful they are. It’s an enormous advantage to shoppers helps to build Amazon’s giant community. 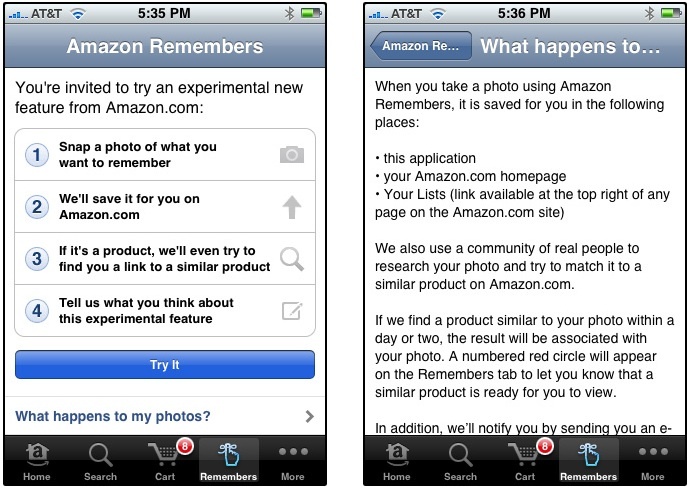 You can take a photo of a product, upload it and have it identified by “unpaid” Amazon users. It leverages real people willing to do the work to ultimately tell you where you can buy the product. (Most likely on Amazon – brilliant). And a large portion of the community are probably influencers who gently nudge buying without even knowing it. On a related topic, Amazon has scooped up SnapTell, a company that allows mobile users to take photos of products or advertisements to get special deals or more product info. The development will be valuable to SnapTell users who download the application to their iPhone. When end-users snap a photo of a cover and send it to SnapTell, they get information back about prices for the product at stores. With both photo image capabilities and the SnapTell acquisition, Amazon will be able to use their community for two very profitable functions. It’s a winning combination for both Amazon and consumers hungry for product information. The Amazon review community recently earned insanely heavy media coverage with the “Three Wolf” t-shirt phenomenon. (A quick Google search of “Three Wolf shirt” yields over a million hits) A viral thread of the t-shirt reviews took off in May and sales went through the roof. At the end of last month, it was selling more than 100 an hour. Read more about the cultural hit in the New York Times article. With these two recent developments, Amazon is trying to cement its place as the one-stop destination for every shopping experience - from first contact to product purchase. Source: Mobile Marketing Watch article.